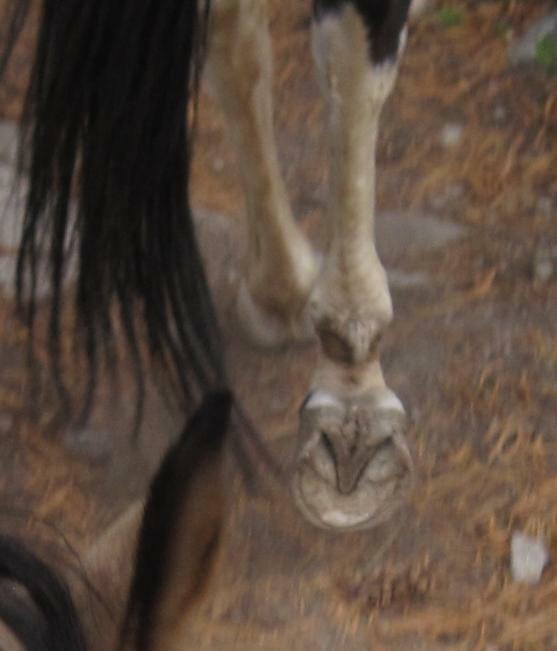 The worst thing about taking your horses barefoot is that you become a hoof snob when it comes to looking at other horses’ feet – so many hooves like baked-bean cans, frogs an inch off the ground, ridiculously long toes, or hoof-walls flared to dinner plate dimensions. A friend was recently telling me about her horse going lame during an endurance ride and how the vet had diagnosed unbalanced shoeing as the problem. She confided to me that her horse was now in “special shoeing” (she never explained what this “special shoeing” was – just that the horse was unbalanced but that “you could only see it on x-rays”). From her description, it sounded suspiciously like the horse had been allowed to grow too long a toe, had underslung heels, and was perhaps a bit unbalanced laterally – all things that your average attentive barefoot trimmer would be watching for and trying to correct every time they rasped their horse. I asked how often the horse would be shod and she said “oh, every 4-5 weeks”. 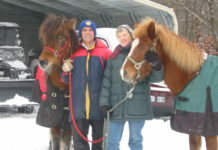 I suggested that she veer towards the 4 week option as know from experience that at four weeks my horses feet are already “too long” and out of whack. If that was her horse’s problem, the “special shoeing” wasn’t going to achieve much if its hooves were allowed to grow back to their formerly long proportions. Her argument was that “well, the horse is going to be on ‘light’ work [he’s on a walking-only regime for a month], so likely his feet won’t grow much”. 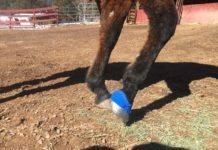 In my mind’s eye I thought of Uno’s currently too-long feet – Uno who’s been standing around in his paddock of duff-footing, doing absolutely nothing for the last 4 weeks, getting time off after Virginia City 100. Hmm. Uno’s right rear foot this weekend, during a 15+ mile barefoot ride on the Pacific Crest Trail in amongst volcanic rock and granite outcroppings. He was last lightly-trimmed when I took his Glue-Ons off after VC100, 25 days ago. The flare you see on the outside is the reason I was having difficulties keeping Gloves on his rear feet back in August – duck-footed R us – a problem I have to keep on top off. You can also see how his bars tend to overlay and his heels get underslung. How would he fare on a 5-6 week shoeing schedule? Not pretty, methinks. But I understand that the average person can’t afford to have new shoes slapped on their horse(s) every 3-4 weeks. Indeed, you get into nail-hole problems if you do shoe too often and there’s not enough solid hoof to nail to. But the quandary is, by the time the horse has grown out sufficient fresh hoof to nail to, he’s too long to be at optimum hoof length. When I used to shoe Roo for competition, I was in a constant struggle to balance his shoeing cycle with his endurance ride schedule. 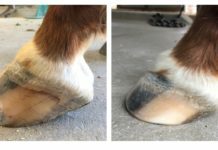 Ideally, Roo needed shoeing every 4-5 weeks (by 5 weeks he was too long and his toed-in front feet would start to look ugly). The perfect scenario was for his feet to be at 2½-3 weeks for a distance ride, but of course if we did a ride once a month it never quite worked out. Nowadays, with a bunch of barefoot horses, I try and keep them where they need to be all the time – no scheduling necessary, unless you count the: “ack, we’re going to a ride next weekend, so I really need to trim this weekend” (sort of like realising you’ve still got homework to do on a Sunday night after a fun weekend). Of course, real life gets in the way (I’m gone for work 12-13 hours a day, five days a week) and I don’t always trim everyone as often as they should be trimmed – the two non-working horses sometimes go a couple of months before guilt gets me back to them, vowing each time that “I won’t let them get that long again” (just don’t look too carefully at them if you visit, OK?). But for the most-part, the worker’s feet stay under control. In the same way you’d file off a split nail on your own finger when it occurs, I keep an eye on their feet and will rasp off any chips as they happen. Uno’s long toes get regular attention – mostly because I hate the way his feet look and they make me crazy when they start to splay out. Formerly, could I have afforded to keep my horses shod as often as they needed? Nope. Did I used to sometimes shoe someone, only for them to go lame or get sidetracked on a different horse and realise that I’d spent $125 for the shod horse to stand around in the paddock, eating hay? Yup. Is keeping six horses’ feet under control hard work? Yup. But then so is stacking a truck-load of 100+ lb bales of hay, or having to leap blearily out of bed at 7 am on a Sunday because you get woken up by unexpected pouring rain outside and remember that your hay isn’t covered. So is mucking stalls all winter long because your horses can’t possibly step out into the rain to poop. But in the long-run, the satisfaction I glean from having my horses feet where I want them (and if they aren’t, it’s my problem) is worth it to me. Sure, it’s easier to just schedule the farrier, but I seldom have to avert my eyes from a set of baked-bean can hooves in my paddock.